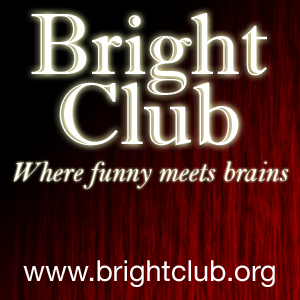 If you head over to our iTunes feed (it’s on the right) you can download the first-ever Bright Club podcast. What happens when Dr Lucie Green, heliophysics researcher, science evangelist and Royal Society award winner, and Kent Valentine, Australia’s funniest man, try and make sense of the solar system? 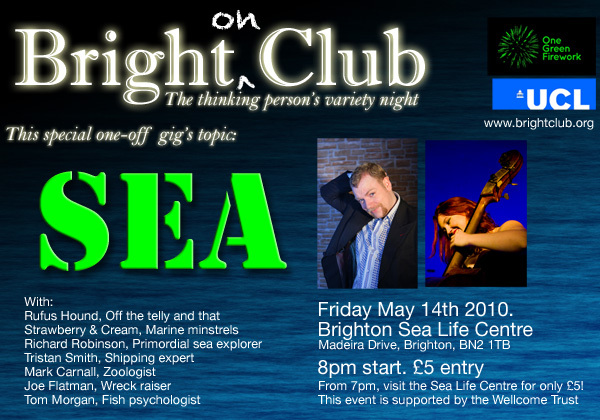 We’re coming to Brighton on May 14th! And we’re going to be very, very funny. There will be a comedian being funny, musicians being funny, academics being funny, a museum curator being funny and scientists being funny. Last night’s London show will be transferring to Brighton on May 18th, as part of the Brighton Fringe. Hear Rufus Hound’s beautiful poetry and expose of the futility of the sea. Learn about fish brains from Tom Morgan. Explore ancient art of the sea with archaeologist Joe Flatman. Sink into the worst that the sea has to offer with zoologist Mark Carnall. Comprehend the world’s dirty shipping habit with marine engineer Tristan Smith. Find out where life came from with raconteur Richard Robinson.